Cleaning your fretboard is one of the most basic yet most vital guitar processes you’ll need to carry out as a musician. Not only can it help to keep the aesthetic of your guitar looking beautiful, but it can also help you produce the best sound and reduce the risk of problems like fret buzzing. To help you keep your guitar’s fretboard in a tip-top condition, today I’m going to share with you the beginner’s guide to cleaning and polishing your guitar frets, ensuring you do a perfect job every time. The first thing you’re going to want to do is to take off all the strings of your guitar. This is, so they don’t get in the way, and you can accurately approach each and every part of your fretboard without missing a section. Once removed, you’re ready to start cleaning. There are many approaches you could take when it comes to cleaning and polishing your guitar frets. Perhaps the most common technique is using steel wool. If you do decide to use steel wool, make sure you’re only using 0000 grade. Otherwise, you risk damaging the wood. The other tool you may need is a toothbrush to scrub out the finer area with less pressure, and tape so you can protect the sensitive areas of your guitar from damage and steel wool debris. With the tape, place it over your guitar’s pickups, since these contain magnets that could collect steel wool fibers. Another great purchase is a fretboard conditioner, which can easily be found online or through your local music store. The first step here is to apply your conditioner to your fretboard lightly and carefully rub it in using your pad of steel wool. The trick to remember here is to turn your steel wool over regularly to maintain an even coverage. Start by moving up the fretboard from the body of your guitar, and work slowly around the fretboard, rubbing the side of each fret. Once you’re happy that your fretboard is clean, run your steel wool up and down the fretboard to polish off each fret. 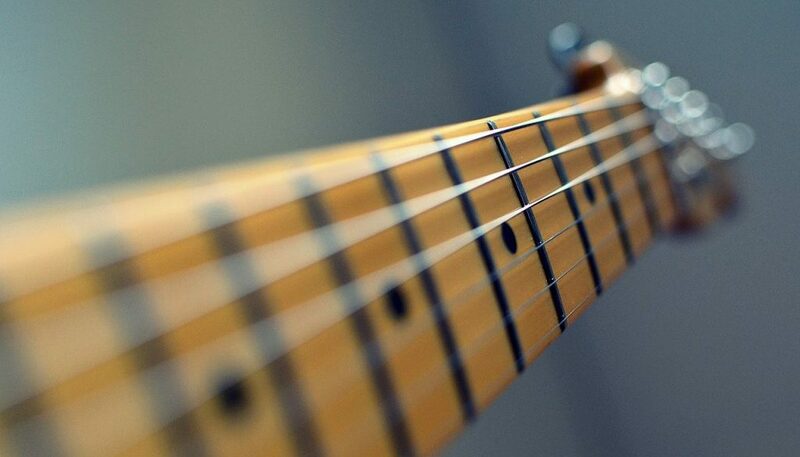 When you’re finished, be sure to vacuum your fretboard to remove any traces of steel wool fiber that may be left. A toothbrush can be a great alternative to using steel wool since you’ll be able to apply a much more controlled amount of pressure, perform more detail cleans and there’s less risk of leaving fibers on your board. The approach is the same as if you were using the steel wool. This means simply applying a gentle amount of conditioner and then rubbing it in using the brush. Once you’ve completed the length of the fretboard, be sure to polish each and every fret in turn while putting extra effort into the immediate side of each fret. Once you’re happy with your work, simply use a slightly damp jay cloth or kitchen towel to give your fretboard a once over. This will make sure all your grease, grime and dirt that collects from playing is removed, leaving you with a seemingly brand-new fretboard. Gavin Whitner is a guitarist, composer and songwriter. He’s blogs at MusicOomph about guitars, pedals, pickups, and all things music. He also contributes to Music Connection, Making Music Magazine, and a few other publications.